It’s my pleasure today to feature a picture book self publishing case study for a change of pace. Full disclosure: Shelby Wilde is an editorial client of mine from earlier this year. We worked on this picture book manuscript together and discussed her career next steps. She decided to self-publish her project, and did, in my opinion, a wonderful job with it. Here, she shares her experience with deciding to “go indie,” the unexpected things she learned, and her lovely book. A long article, but a must-read. Hear about it directly from Shelby, below. I will pop in occasionally to comment with takeaways over the course of the interview! 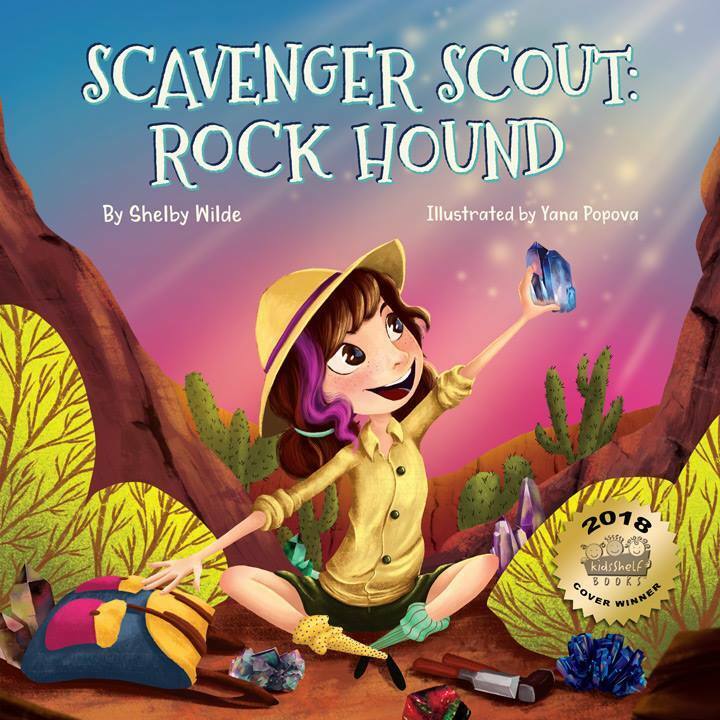 Scavenger Scout: Rock Hound by Shelby Wilde, today’s picture book self publishing case study! When I decided to self-publish SCAVENGER SCOUT: ROCK HOUND, I spent months researching the process. I knew I would have to pull out all the stops in order for the book to compete with the quality of traditionally published books on the market. I chose to have hard cover books printed in China, which I would then sell through Amazon. Hard cover format is the preferred format for children’s picture books. There is another self-publishing path called Print on Demand (POD). I did not choose that option because there are very few POD options for hard cover books and the quality is not where it needs to be, in my opinion. Traditional publishers have set the bar high when it comes to the quality of children’s books and self-publishers need to meet and exceed consumers’ expectations. Kidlit Takeaways: Picture book writers have the self-publishing options of choosing to print physical books in softcover, hardcover, or both (a big investment upfront as you have to buy a print run of expensive books), POD (no upfront investment but quality control can be an issue), or ebook (despite being easily suited to illustrated content, ebooks do not offer the same reading experience for parents/children as physical copies). Shelby’s point about competing with traditionally published books is spot on. I tell this to my clients all the time: You can do whatever you want when you self-publish. But you are selling to customers who are used to spending money on traditionally published books, and standards are high as a result. You need to offer them something equal or better in order to convince their dollars to come over to the indie side! What is this book’s “origin story”? SCAVENGER SCOUT: ROCK HOUND was inspired by my daughter, who is a rock hound—she loves hunting for rocks. One day she sat me down and started telling me stories about how she acquired each of the rocks in her collection. In her stories, she debated with dragons, haggled with mermaids and convinced aliens so she could take home her treasured rocks. The combination of fantasy and reality inspired me, and I know it is something that captivates kids. How did you make the decision to self-publish and why? Early on, I considered the traditional publishing path for SCAVENGER SCOUT, but soon after the manuscript was completed, I realized I felt a strong connection to the main character. I wanted to guide her story through the publishing process myself, overseeing every aspect. Another reason I decided to self-publish is that I wanted to select the illustrator. If you choose the traditional publishing path and sell your book to a publisher, they will select the illustrator. Because I was so connected to the character of Scout, I wanted to be able to choose the style of illustration that would bring her to life. Kidlit Takeaway: Choosing to self-publish gives you ultimate control over your project. Control you would lose with traditional publishing because the publisher does have final say on issues like title, format, illustrator, etc. But with great power comes great responsibility, and it behoves you to do your due diligence and make strong, marketable decisions. Describe the process of preparing the book for publication. What was unexpected? What did you learn? When it comes to preparing the book for publication, selecting the illustrator is only the tippy top of a very large iceberg. The most important thing I learned is something that should have been obvious to me: When you decide to self-publish, you will need to wear all of the hats that a traditional publishing house does. You will need to hire an editor (or editors—did you know there are different kinds? ), an illustrator, a book designer (or your illustrator may be able to provide this service), a printer, a shipping company, storage space (if you are having your books printed and shipped to you, instead of ebook or POD). The difference is that the publisher has a team of people who are specialists in their areas and you have just … you. A writer. The learning curve is steep, but it is doable as long as you’re willing to put the time in. One unexpected challenge was dealing with long timelines. Traditional publishing cycles are long: it typically takes two years to bring a book to market. Self-publishing is a little bit faster—mine took 11 months from start to finish, but still not quick. You have to have a lot of patience. If you have ever created something to sell, the last thing you have is patience. You can’t wait to get it out there. And even though you are a small, nimble company (yep, you need to get a business license if you want to self-publish), you are stuck with a lot of timelines that you don’t own. It takes weeks to months for the illustrator to complete their illustrations, months to print and ship the books, months to promote the book before launch. Another unexpected challenge: Advertising budget: I didn’t think much about funds for advertising when I was in the planning stages. It’s just a fact that if you want a product to sell, you have to advertise it. Advertising is a skill and it costs money. It’s also relentless. If you stop advertising, you will see an immediate drop in sales. While it’s true that even if you sell your book to a traditional publisher you will still have to market it, at least you’ll have some support from the publisher. Kidlit Takeaway: The leap from writer to publisher can be a rude awakening. Self-publishing isn’t just a shortcut to making your work available. You are responsible for many things you’ve thought of–and haven’t yet! Shelby also brings up a great point: budget. Do you have one? Picture books are especially expensive to self-publish (as opposed to a novel made available on Kindle, for example) because the biggest expense is the illustrator. To hire a good one, you have to pay thousands of dollars (five figures isn’t unusual). Otherwise, it will show. Unfortunately, readers do judge a book by its cover. Layout costs more money. Then, if you’re creating a physical book, you have to pay for expensive full color printing on a bigger trim size product. Shipping. Storage. Shipping to the consumer. And that’s before you even think about marketing. Picture book self publishing comes with sticker shock! Describe the process of launching the book. Any lessons there? This is another area where you have to understand that publishing is a business and you have to do all of the same things that traditional publishing houses are doing in order to compete. Among the activities you will want to put on your launch list: blog tour, social media ads, frequent social media posts, giveaways, partnerships, cross promotion with coordinating products, press release, media interviews, email blasts. Just like the production of the book, launching the book involves skill sets that writers don’t often have: public relations, media relations and marketing. The most important thing I learned when I launched my book is that you have to start months in advance. Kidlit Takeaway: Marketing is a skill in and of itself. But all writers, whether indie or traditional, have to learn it at some point. The good news is, you are allowed to take small bites. That’s why I like the tip about starting months in advance–you’ll want to give yourself plenty of runway to learn. What’s life after independent publication like? How are you currently involved in marketing the project? I have completed my launch communication plan and have now moved into the “Keep the momentum going” phase. Frequent social media posts, cross promotion, blog tours, book reviews, giveaways, email blasts, etc. Once you self-publish a book, you are now on the hook for marketing the book forever. That sounds daunting, but you have to think of it like any other product. Products don’t sell themselves. You have to put yourself out there as the author, put the book out there through ads, all to keep the stream of people flowing to your book. I enjoy the marketing aspect so it’s fun for me, but it is also time consuming. Kidlit Takeaway: Ah, the old “art vs. business” debate! A great reminder that any book, even a traditionally published one, becomes a product. And then you sell it forever. The good news is that every positive review, blog post, interview, etc. gives you additional traction, but you always have to be proactive about creating opportunities. Unfortunately, “if you build it, they will come” is not a realistic adage in the age when hundreds of thousands of books are being traditionally and independently published per year. What’s on the horizon for you? Would you self-publish again? Why or why not? When I wrote SCAVENGER SCOUT, I also wrote a sequel so I have committed myself to self-publishing that book as well. I anticipate launching in Q2 of 2019. Once SCAVENGER SCOUT Part 2 is out, I will definitely have my hands full managing the printing, shipping and inventory that will come with both books. I am just one person and I’m not interested in becoming a small publisher. I have three other completed manuscripts that I’ve decided to pitch to agents in hopes of getting a contract from a traditional publisher. Choosing the self-publishing path means you are choosing to focus on the business side more than you will focus on the creative side. I want to have more time to spend on writing so I’m happy to let a publisher handle the logistics, even if it means lower profits for me. Kidlit Takeaway: The takeaway I hear from clients all day every day is that writers are very surprised that they have to become publishers/marketers/businesspeople when they self-publish. They are not just writers. In fact, writing often falls to the bottom of their To Do list. Shelby’s point here is a great one to remember. It’s echoed in Teresa Funke’s excellent and very in-depth online class on self-publishing via Writing Blueprints: each project has its own life and potential. For some projects, self-publishing is the way to go. For other projects, you can always try traditional. Having these options means you can learn about them and choose the ones that are right for you on a project basis, and on a career basis! The bigger message is this: Successful, tenacious writers have more than one project in the pipeline! Looking to make the jump into self-publishing? My editing services are perfectly suited to writers preparing to go indie. Get professional eyes on your work so you create the strongest product possible. Mary and Shelby, thanks for sharing this journey! I have some self-publishing clients, too, and am sending this to all of them. That’s awesome! I think she shares some real wisdom here, and I think writers are going to be much more receptive to hearing it from someone who’s been through it.